Once again, I wish I had recorded all the conversations of the day, there was so much rich information shared. I find myself torn among three focuses of law practice - obviously first is child advocacy, but second and third are closely tied: environmental law and LGBTQQ rights (again, a story for another day). When I came here in 1995, it was for a vacation that might never have happened. My buddy Jodi was stationed here and commanding a company that did mapping work. She offered her hospitality for as long as I could stay in exchange for me getting dive certified. I got dive certified (for a woman with height and claustrophobia issues, pretty impressive), and came over for 3 weeks (Yes, Dean, I know I should spell out three!). The minute I stepped off the plane, I absolutely knew I had to live here, and so I served a year in Korea, was rewarded with a stationing in Hawaiʻi, and I stayed. It is that powerful here. And lovely. Once we finished breakfast (and let us say that eating breakfast while staring at the ocean should never go quickly), we gathered around a table (I took to the shade) and discussed the Pupukea Marine Conservation District in depth. This particularly is where I would wish to have recorded the conversation. :( But you can get a detailed history at http://www.pupukeawaimea.org/about_mpw.php. We got a very good schooling from Rhiannon on the history of constructing the signs at Pupukea (Sharkʻs Cove for others of us). 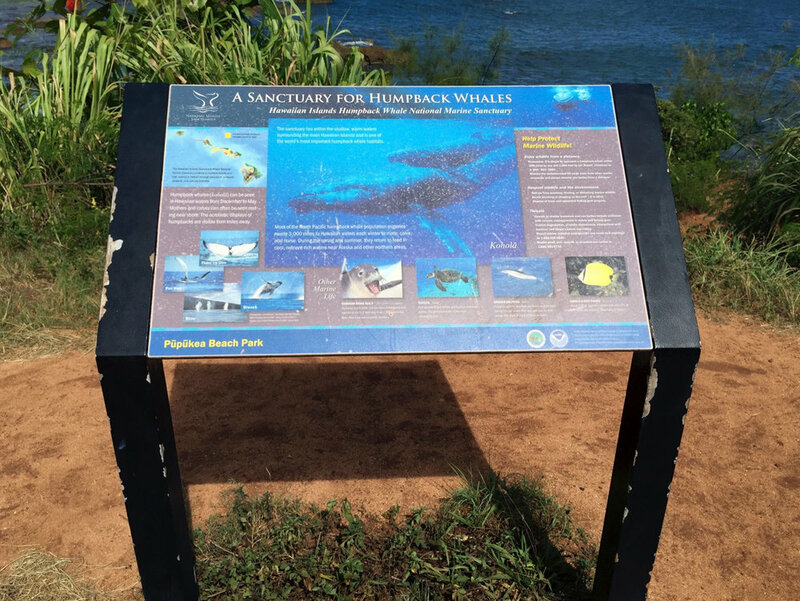 The making of the signs that are at Sharkʻs Cover was very detailed, and involved a lot of different sponsors (to include the Hawaii Tourism Authority and the Coral Reef Alliance). It outlines that our reefs are special, and yet the detail is lacking the fact that you are actually standing at Sharkʻs Cove. Nevertheless, when the signs first went in a few years ago, as a scuba diver I appreciated their information and the intent. Working to replenish and sustain the natural and cultural resources of the Pupukea and Waimea Ahupua'a for present and future generations through active community stewardship, education, and partnerships. Objective 1: To document, report, and reduce poaching. Objective 2: To increase the knowledge of and support for the ecological values, rules, traditional and cultural importance, and user impacts on the Pūpūkea and Waimea ahupua'a—focusing on the MLCD—among the community, youth, visitors, and users. Objective 3: To discover what the pollution threats are, if any, and then create a plan to address them. Objective 4: To create a system of sustainable financial and institutional mechanisms that will support the activities of the Mālama Pūpūkea-Waimea in the long term. Objective 5: To protect and strengthen the laws and policies that created the MLCD and that support Hawaii marine managed areas. A number of students went to snorkel, others to go and collect trash from the beach. Luckily, not too much trash was out! And the snorkelers had a great time as well. They snorkeled in the tidal pool, which is a nursery for juvenile fish, and particularly active at night. Might be worth a trip post dive one night in the future for Wayne and me! From here we grabbed lunch snacks at Foodland, and drove up to the Pu'u O Mahuka Heiau. 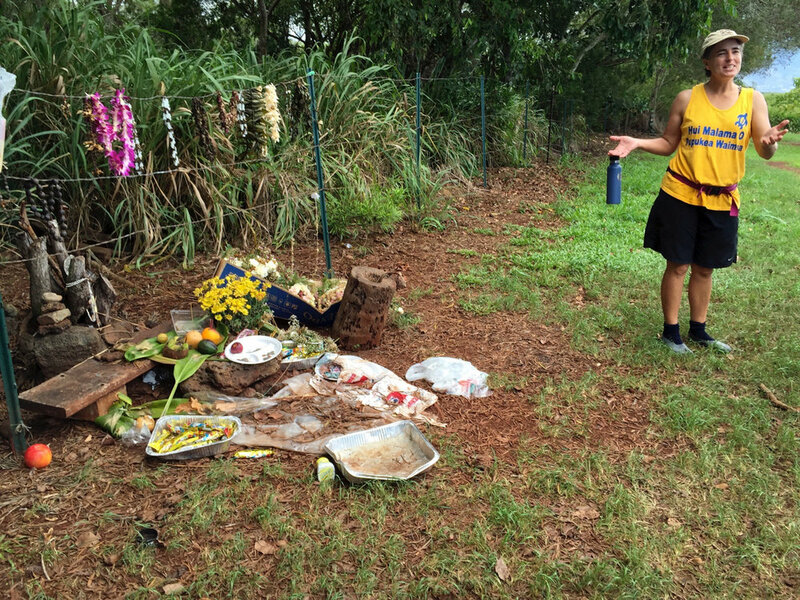 Forgive my Facebook posts where the phone autocorrected Heiau to Heidi! I told the darn phone to learn the word. 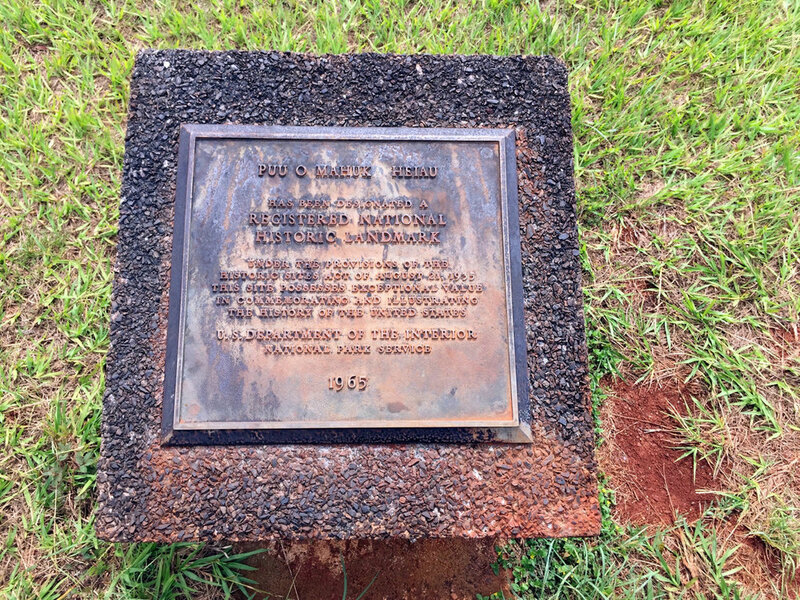 :) As I understand it, the Puʻu O Mahuka Heiau was dedicated to Ku, god of war, and of the forest. 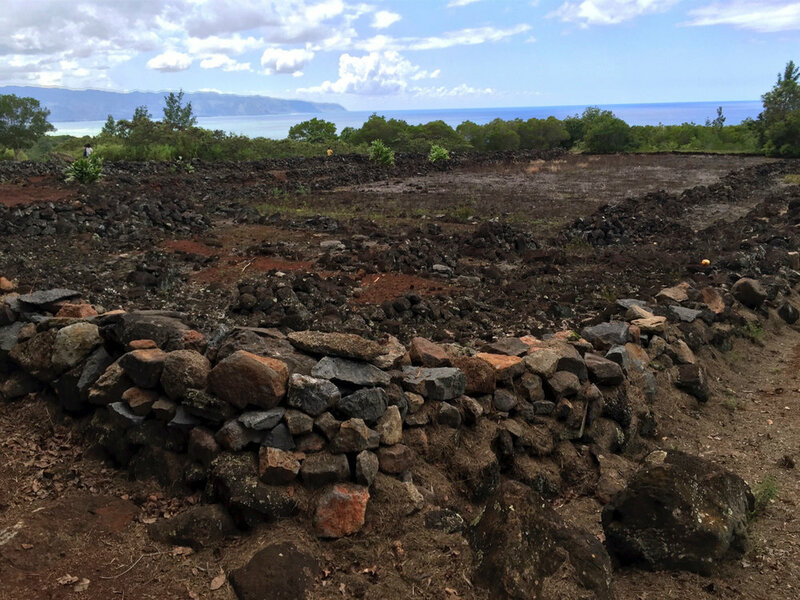 A heiau for Ku was sacrificial government war temple that was dedicated to the god Kuka’ilimoku (Ku). Human lives were taken at the altar when assurance of success in combat was requested from Ku. The same goes for emergencies such as pestilence or famine. Higher-ranking position holders and priests had the authority to construct agricultural temples (dedicated to Lono), whose ceremonies were open to all. War temples dedicated to Ku could only be built by the ali’i-ai-moku (lower ranking chief and land owner). The king, high-ranking chiefs and members of the Ku priesthood were the only ones authorized to enter. Dedication of the war temple by anyone else was considered treason. Only the high chief could undertake the rituals involving human sacrifice, which was considered the highest form of offering. Of course, by now, we were about 2 hours behind our initial schedule with Dean A, but it was a lovely Saturday, and we had nowhere to be but on our adventure! Our next stop was Dean Aʻs lovely, lovely home. For privacyʻs sake I did not take any pictures of her home or her yard, but allow me to say both of them are magnificent. Her home is one of the first five built in her area, where each lot has a mandatory minimum size of one acre. Hers is filled with fruiting trees - avocado, lychee, tangerine, papaya, soursop, banana, and starfruit for starters. I could go on for days about everything there! She is also using her neighbor’s lot to plant a native species forest (she calls it her Pupukea Community Demonstration Forest) from the grass on up to the koa trees. The inside of her home is spacious, colorful and open, but her lanai is just begging for some hammocks! We gathered much of the fruit (and I had my first ever taste of starfruit! ), and started to disperse to the four winds. Four of us accompanied Dean A up to the Boy Scout Camp so that we could hike the Pupukea Forest Reserve Kaunala Trail, with the goal to head to Drum Road, tying in to our Waimea Valley discussions a few weeks prior. We picked up two travelers from Florida along the way who were looking to hike the same trail. Since it is behind a gate that says entry is forbidden by the military, it is easy to understand their confusion. :) There were rain clouds to the west that looked like they were coming our way, and the three of us with iPhones all got a flash flood warning. Dramatic! The start of the trail is an easy road covered in needles from one of our more invasive trees, ironwood. While they make the trail softer, the Australian Pine (Casuarina equisetfolia) has rampantly overgrown, killing out other native plants, and ruining the habitat for many native species. All to soon, the trail became a paved road. The road is the result of an easement on the land by the Army, which was used to connect one training area (I think in the Kahukus, but I am often wrong) to Helemano Military Reservation and Drum Road. The road along the way was, ahem, amusingly populated with some rather poorly spelled signage, one of which you will see down on the left hand side of the screen. The signs and the paved road struck me with Wayne’s favorite irritation - cognitive dissonance. Seeing a road, speed limit signs and yield signs in the middle of a forest just strikes me as plain silly. Ah well. Although the goal was to make it to the second gate and get to Drum Road, we were hampered a wee bit. Just as we were hitting a significantly steep uphill incline on our trek to see the great view, it began to rain. Out came the plastic baggies for the iPhones, and onward we trudged. Soon the rain became a downpour, and Dean A, Wayne and I were the only hikers left going up. Dean A started looking for a cut on the side of the road that would lead us up to the view, but was thwarted at least once (Jodi, it was like St. John, where we were sure it was just another two s-curves ahead). We finally found it, and Dean A gave me a hand up the hill, led me around a tree, to one of the most spectacular views ever. The plastic baggie did not let me do homage to the view. You can see wind turbines, rain, the valley, Kaʻena Point, and the beautiful Pacific ocean backlit by the sun. Wayne wants to go back and hike it again without rain, and with the trade winds. Oh, did I mention today had no trades and a lot of vog? It was HOT, even at altitude, and with rain. We changed our wet, dirty clothes and shoes Hawaiian style, and started the drive back home. And the pièce de résistance greeted us as we climbed up out of the valley.